You can murder the man but not his moral example and legacy. Next February 29th Oswaldo Payá Sardiñas would have turned 63 years old. Oswaldo's family and his compatriots in the Christian Liberation Movement invite you to join us in celebrating the Holy Mass presided by Father Rumin, this Saturday at 12 noon in the Ermita de la Caridad. After the Mass, the procession will march to the statue that reminds us of Father Felix Varela, the Cuban priest, whose life had been an example and inspiration for Oswaldo Payá. When I was 9 years old they jailed my father for problems with the government and I had to go see him the El Principle prison. Later my father had leave as a former political prisoner to exile. I had the opportunity to leave but decided to stay to struggle for the freedom of my Cuba. I was always repressed because of my ideals but never had a mentor to guide me until having the happiness of knowing our leader Oswaldo Payá Sardiñas; he showed me how to fight nonviolently to free Cuba from this dictatorship that has given so much suffering to the whole people. Today I remain threatened and have a son imprisoned in order to repress my way of thinking. They will not obtain it. I will continue defending the legacy that our leader Oswaldo Payá Sardiñas left us until the end. Rosa Maria signed the letter "Liberty and Life ... for a peaceful transition to democracy ... The Peoples Path." The Castro regime may have murdered Oswaldo Payá but his spirit and nonviolent legacy live on and when Cuba is once again free, in part, it will be thanks to him. The Obama administration made two announcements on Cuba that are in dissonance with each other on the same day. On February 25, a State Department official said that "[a] review ordered by Obama on whether to take Cuba off the blacklist was 'moving forward as quickly as we can ... but we don't think that should be linked to the restoration of diplomatic relations.'" It appears that the administration is moving as quickly possible to remove the Castro regime off the list of state sponsors of terrorism but the process does take time due to statutory requirements. This is part of its publicly stated aim of normalizing relations with the Castro regime. Voices, representing NGOs with the president's ear ridicule the Cuban dictatorship's presence on the list of terror sponsors. On March 1, 1996, by Proclamation 6867, a national emergency was declared to address the disturbance or threatened disturbance of international relations caused by the February 24, 1996, destruction by the Cuban government of two unarmed U.S.-registered civilian aircraft in international airspace north of Cuba. 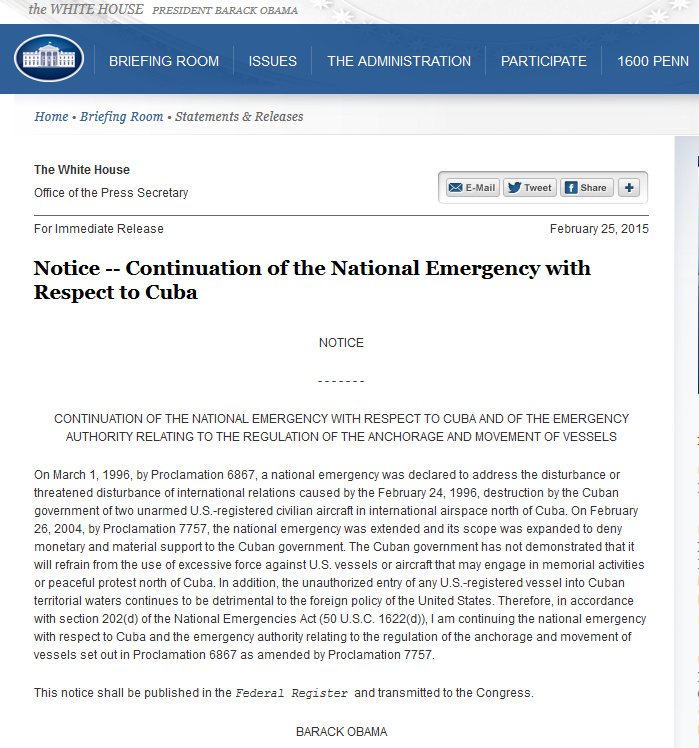 On February 26, 2004, by Proclamation 7757, the national emergency was extended and its scope was expanded to deny monetary and material support to the Cuban government. The Cuban government has not demonstrated that it will refrain from the use of excessive force against U.S. vessels or aircraft that may engage in memorial activities or peaceful protest north of Cuba. The Obama White House on February 25, 2015 is saying that it believes that the Castro regime is still willing to destroy unarmed, civilian aircraft or vessels in international airspace or waters north of Cuba if they "engage in memorial activities or peaceful protest." Let that sink in for a moment while at the same the State Department is defensively explaining why it can't go any faster in taking the Castro regime off the list of state sponsors of terrorism. 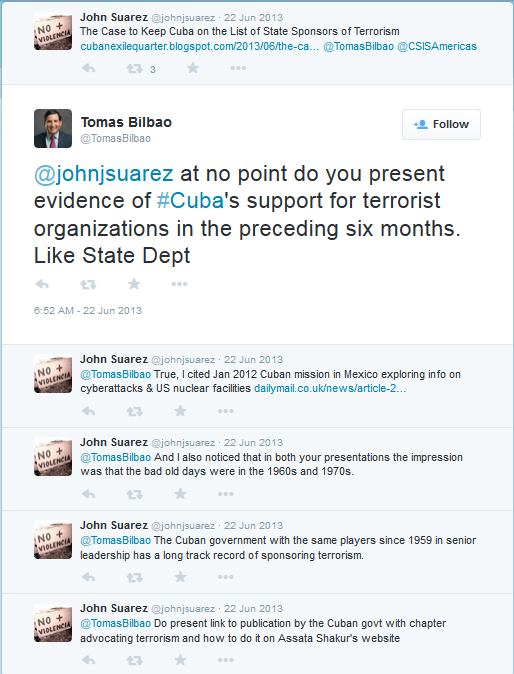 Unfortunately this malady isn't only found in government as the following exchange over twitter with Tomas Bilbao of the Cuba Study Group on June 22, 2013 illustrates. Mr. Bilbao advocates taking Cuba off the list of state sponsors of terrorism. At the time I had made the counter argument which you can read here. Less than a month after this exchange on July 16, 2013 the Castro regime was discovered smuggling a ship load of weapons hidden under bags of sugar that included MiG fighter jets, rockets, and ballistic missile technology to North Korea in violation of international sanctions. The bottom line is that seeking to normalize relations with an abnormal regime is a recipe for failure not to mention cognitive dissonance. The Bush policy on North Korea being a recent and cautionary example. More students protesting the Maduro regime in Venezuela continue to be shot in the head. On February 22, 2015 this blog posted five cases between February 17 and February 21 Sadly the body count continued its increase on Tuesday, February 24. 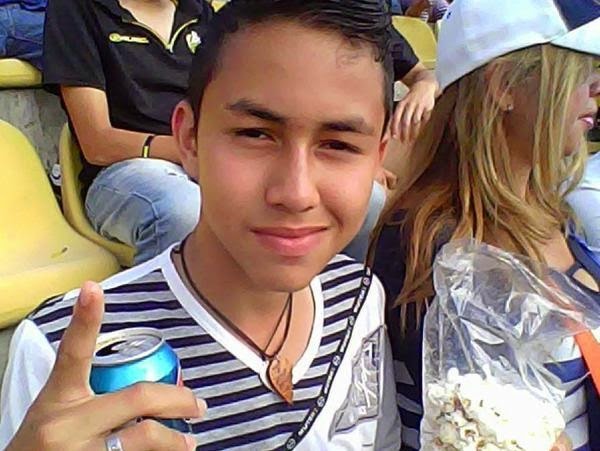 The latest is the killing of of 14 year old high school student Kluiverth Roa, at the hands of a member of the Bolivarian National Police of Táchira State identified as Javier Mora. This officer shot the teenager in the head, killing him on the afternoon of February 24th. According to witnesses, Kluiverth Roa, a student in San Agustín Codazzi school in San Critóbal, had just gotten out of school and was in the Barrio Obrero sector of the city, three blocks from the Catholic University of Táchira (UCAT) where a student protest was taking place. Witnesses said the the teenager was surprised by a couple of functionaries riding on motorcycle and one of them shot the youth in the head. 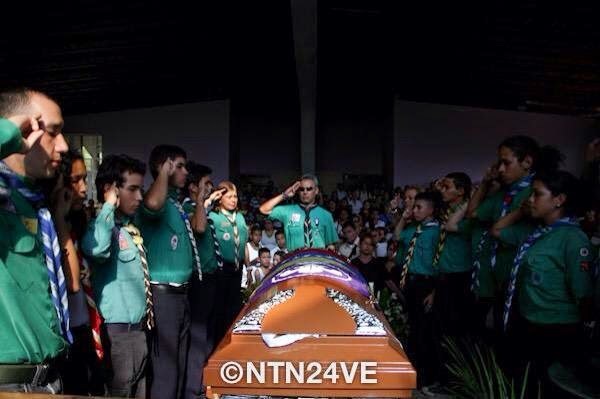 Kluiverth Roa was buried on February 25th with his Scout troop serving as pallbearers. The respected human rights organization Provea warns that the "killing of Roa Kluiverth is not an isolated event, but is a consequence of the rise of repression in the country." The rapper El Critico was released on January 9, 2015 and 21 days later the rapper El Dkano took his place in the revolving prison being sentenced on January 28 to a year in prison for "pre-criminal dangerousness." On 28 January 2015, the rapper El Dkano (real name: Maikel Oksobo) was sentenced to a year in prison in Havana. It is generally believed he was targeted for having used music to express his dissenting political opinions. El Dkano was sentenced under a charge known as ‘peligrosidad predelictiva’ (‘dangerousness that is likely leading to a crime’), which is used to imprison dissidents for long terms. His defense attorney told a reporter from Diario de Cuba that prosecutors wanted the judge to sentence him to five years. American Rep. Ileana Ros-Lehtinen said during a House Foreign Committee hearing in Washington, D.C., that the Castro regime is once again slapping a Cuban rapper with an unjust charge. 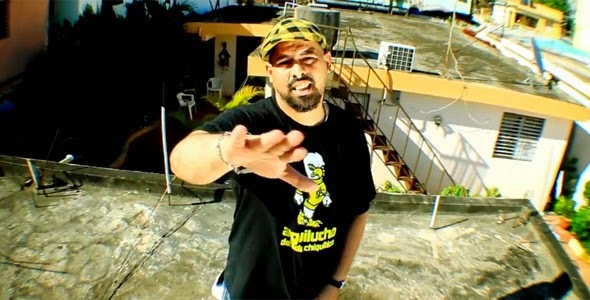 As part of the Obama-Castro deal of 17 December 2014, another imprisoned rapper, El Critico (real name: Ángel Yunier Remón) was recently released from prison. Cuban artist Danilo Maldonado (‘El Sexto’) remains imprisoned since Christmas Day 2014 and is currently in poor health, battling pneumonia in the Valle Grande Prison. Sixty days and counting behind bars for a work of performance art that never saw the light of day. Unfortunately, dictators and tyrants by definition do not have a sense of humor. This is why totalitarian regimes are always associated with the color grey. Boldness, color, spontaneity and daring are necessary elements that bring existence to life and are often times repressed by tyrants. Laughter is especially subversive and dangerous. 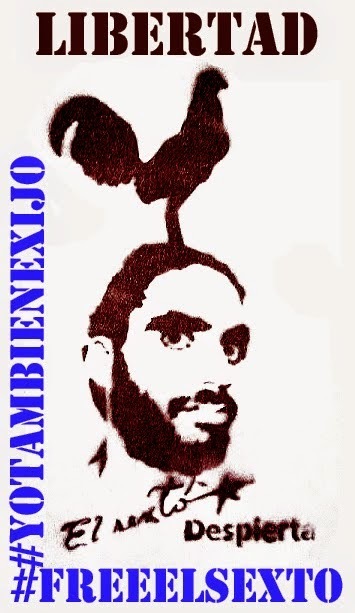 On February 4, 2015 Free Muse reported that "Cuban artist Danilo Maldonado (‘El Sexto’) remains imprisoned since Christmas Day 2014 and is currently in poor health, battling pneumonia in the Valle Grande Prison." On January 28, 2015 the Dutch NGO Justice & Peace outlined the circumstances surrounding his arrest. 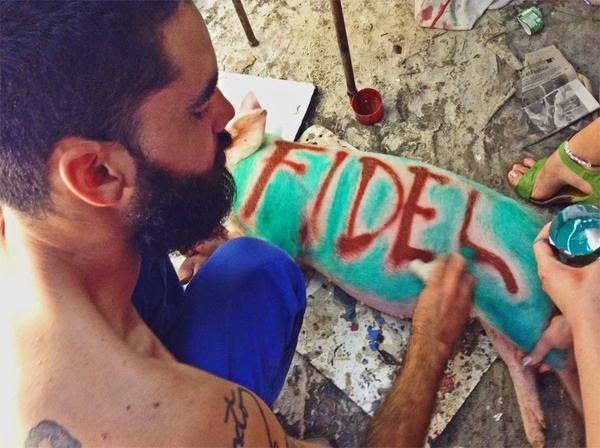 Danilo Maldonado, El Sexto, bought two pigs for an art project and wrote on them "Fidel" and "Raul" and was on his way to a public park to release them when he was arrested on December 26, 2014 before his work could be performed. Still jailed El Sexto has been indicted for "disrespect" that carries a maximum sentence of three years in prison. 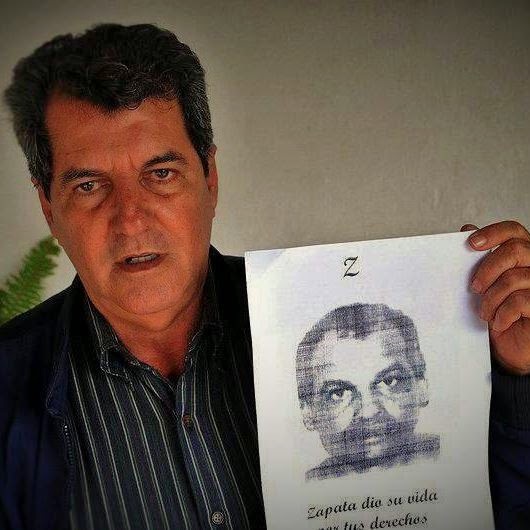 The Czech NGO, People in Need revealed that, "[i]n the beginning of this year, the Cuban authorities refused his application for habeas corpus submitted by Laritza Diversent, an attorney who denounced his arbitrary detention." enigma to decipher each symbol. Will the President answer a mother's question about her murdered son? billed as a "Town Hall" but is a closed event. Those who will be attending have most likely been "selected." This is just a day after a silent protest for justice was held at FIU by family members of the four men murdered on February 24, 1996 in the Brothers to the Rescue shoot down. 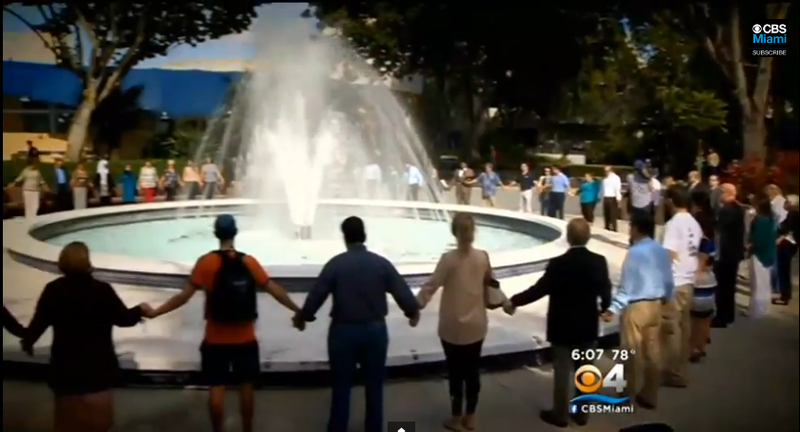 The university community, including Mark Rosenberg the President of FIU, took part in the silent vigil. Following the vigil the families of Armando Alejandre Jr., Carlos Costa, Mario Manuel de la Peña, and Pablo Morales laid flowers at a tree dedicated to the four men on March 7, 1997. Miriam de la Peña, whose son Mario was killed on February 24, 1996, spoke on camera summarizing the events that led to her son's death and concluded by asking President Obama why did he free her son's murderer who was serving a double life sentence? The families held a Mass at 8:00pm at Our Lady of Charity in Coconut Grove where the officiating priest gave a masterful homily on truth and justice as necessary conditions for authentic reconciliation while at the same time analyzing the Lord's Prayer and its command to forgive in order to be forgiven. Freeing an unrepentant criminal who is then celebrated as a hero by an unrepentant dictatorship are not grounds for reconciliation and peace. This action is the definition of an injustice.The president's decision to commute the sentences of three Cuban spies including Gerardo Hernandez serving a life sentence for conspiracy to commit four murders will not be seriously addressed by him today. Martin Luther King Jr. in his Letter from a Birmingham Jail wrote "Injustice anywhere is a threat to justice everywhere." The rising violence against democratic activists now in Venezuela is connected to the Castro regime and the U.S. policy of appeasing the Cuban dictatorship will only make things worse. "He who passively accepts evil is as much involved in it as he who helps to perpetrate it." 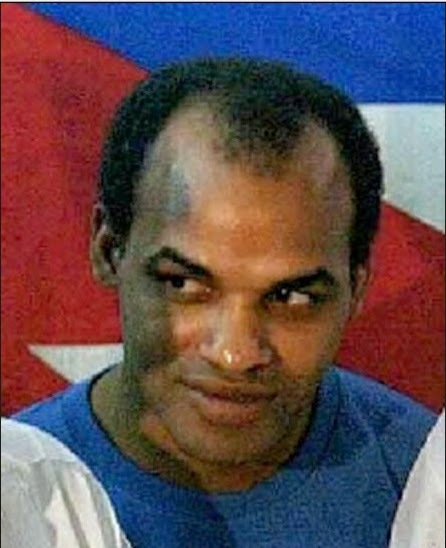 - Martin Luther King Jr.
Cuban prisoner of conscience Orlando Zapata Tamayo died on February 23, 2010 after a prolonged water only hunger strike in which prison authorities over the course of more than two weeks on and off refused him water. Following his death the Castro regime and its agents of influence sought to slander Orlando's memory. However, activists who knew Orlando had already spoken on the record as had Amnesty International. Orlando Zapata Tamayo, died on this afternoon, February 23, 2010, after suffering many indignities, racist slights, beatings and abuse by prison guards and State Security. Zapata was killed slowly over many days and many months in every prison in which he was confined. Zapata was imprisoned for denouncing human rights violations and for daring to speak openly of the Varela Project in Havana's Central Park. He was not a terrorist, or conspirator, or used violence. Initially he was sentenced to three years in prison, but after successive provocations and maneuvers staged by his executioners, he was sentenced to more than thirty years in prison. The slander campaign, so far, has failed because people of good will paid attention and refused to remain silent. In Canada, a punk rock band composed and played a song titled Orlando Zapata that placed his death in context. A video accompanying the song was edited by the Free Cuba Foundation. 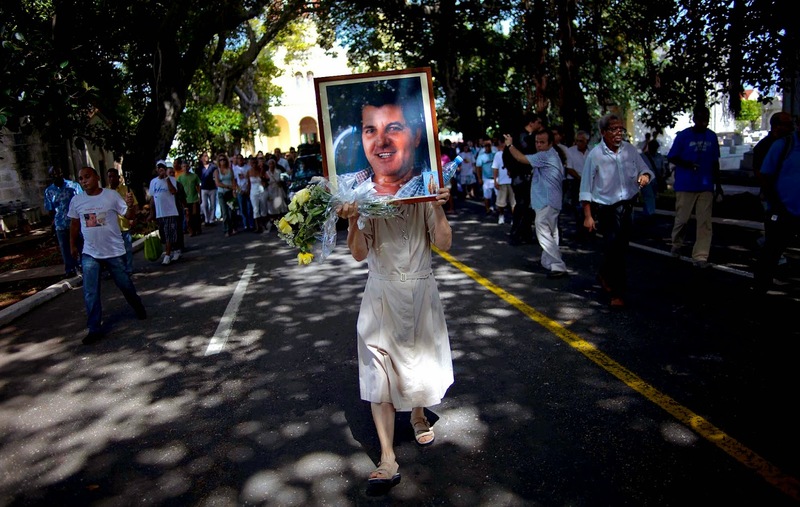 Orlando's death focused attention on Cuban prisoners of conscience and was a factor in their release between 2010 and early 2011. Orlando Zapata Tamayo was born in Santiago, Cuba on May 15, 1967. He was by vocation a brick layer and also a human rights activist, a member of the Movimiento Alternativa Republicana, Alternative Republican Movement, and of the Consejo Nacional de Resistencia Cívica, National Civic Resistance Committee. Orlando gathered signatures for the Varela Project, a citizen initiative to amend the Cuban constitution using legal means with the aim of bringing Cuba in line with international human rights standards. Amnesty International had documented how Orlando had been arrested several times in the past. For example he was temporarily detained on 3 July 2002 and 28 October 2002. In November of 2002 after taking part in a workshop on human rights in the central Havana park, José Martí, he and eight other government opponents were arrested and later released. He was also arrested on December 6, 2002 along with fellow prisoners of conscience Oscar Elías Biscet and Raúl Arencibia Fajardo. Dr. Biscet just released from prison a month earlier had sought to form a grassroots project for the promotion of human rights called "Friends of Human Rights." State security prevented them from entering the home of Raúl Arencibia Fajardo, Oscar Biscet, Orlando Zapata Tamayo, Virgilio Marante Güelmes and 12 others held a sit-in in the street in protest and chanted "long live human rights" and "freedom for political prisoners." They were then arrested and taken to the Tenth Unit of the National Revolutionary Police, Décima Unidad de La Policía Nacional Revolucionaria (PNR), in Havana. Orlando Zapata Tamayo was released three months later on March 8, 2003, but Oscar Elias Biscet, Virgilio Marante Güelmes, and Raúl Arencibia Fajardo remained imprisoned. On the morning of March 20, 2003 whilst taking part in a fast at the Fundación Jesús Yánez Pelletier, Jesús Yánez Pelletier Foundation, in Havana, to demand the release of Oscar Biscet and the other political prisoners. Orlando was taken to the Villa Marista State Security Headquarters. On May 18, 2004 Orlando Zapata Tamayo, Virgilio Marante Güelmes, and Raúl Arencibia Fajardo were each sentenced to three years in prison for contempt for authority, disorderly conduct and resisting arrest in a one-day trial. Orlando Zapata Tamayo would continue his rebelliousness and his non-violent resistance posture while in prison and suffer numerous beatings and new charges of disobedience and disrespect leading to decades added to his prison sentence in eight additional trials. Friends of freedom all too often are on the defensive explaining who and what they are against. The lives of courageous nonviolent activists such as Orlando Zapata Tamayo, Oswaldo Payá Sardiñas, Harold Cepero Escalante, Laura Inés Pollán Toledo and the four men murdered in the Brothers to the Rescue shoot down who were martyred by the Castro dictatorship should be remembered and told to others. The enemies of freedom do not like to have such heroes remembered and honored. For example on May 24, 2010 in Oslo, Norway a Cuban diplomat attacked and bit a 19 year old Cuban-Norwegian girl who was filming her mother's protest on behalf of Orlando Zapata Tamayo outside of the Cuban embassy. The whole episode was a public relations disaster for the Castro dictatorship in Norway. People of good will around the world who wish to remember can join in a 24-hour water-only fast starting at 3 p.m. on Feb. 23, the day and time that Orlando Zapata Tamayo died on hunger strike followed by a silent vigil the following day from 3:21 p.m. to 3:27 p.m. to correspond with the times Carlos Costa, Pablo Morales, Mario De La Peña and Armando Alejandre Jr. were shot down on February 24th. Fasting for 24 hours is a limited way to step, albeit briefly and incompletely, into Orlando Zapata Tamayo's shoes. 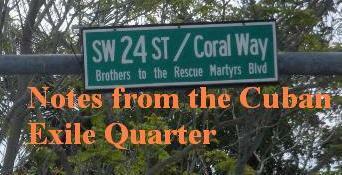 Beginning the fast at 3:00pm on February 23 and completing it on February 24 at 3:00pm just in time to honor and remember the four members of Brothers to the Rescue seems an appropriate way to pay homage. They all demonstrated with the lives they led and by how they died that the Bible passage, John 15:13 is as relevant as ever: "No one has greater love than this, to lay down one’s life for one’s friends." Please use all the means at your disposal through social media and word of mouth to let others know about them. The failure of solidarity with Cubans in the island has led to the Castro regime not only increasing repression at home but also projecting itself elsewhere in the Americas and sadly now Venezuelans are also dying or being killed for defending freedom in their country. Luis Arianyi García and Yamir Tovar were found dead and gagged in Catia by the BNP Saturday morning at 2:00am according to Mildred Manrique. 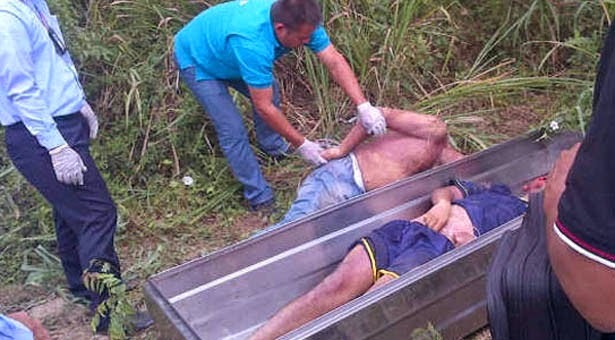 Beatriz Adrián reported that the families of Yasmir Tovar and Arianyi Garcia confirmed that they are in the Morgue. Two students appeared dead in Catia. They were "Resistance" youth. Yasmir Tovar was seen by friends Friday in Plaza Brion. Confirmed that he said he was going to a gathering in Altamira. Yasmir Tovar and Arianyi Garcia were friends say their families that according to the case file were found dead in Catia. The mother of Arianyi and the brother of Tovar went to look for them at SEBIN they were told to bring clothes and mattress. When they returned SEBIN told them it was a mistake. That there was no Yasmir Tovar. They went to the morgue and found both of them. Spoke with Arianyi's mother and with Yasmir's brother in the morgue tonight. They say they do not know what happened. Mildred Manrique reported over twitter that Luis Arianyi Garcia was with Yasmir Tovar and that both died from bullets to the head. They were both opposition protesters. Yamir also had a bullet in the back. Both youth (Yamir and Luis Arianyi) had their hands tied and were found next to each other. Manrique cleared up some rumors circulating when she reported that Yasmir Tovar and Luis Arianyi Garcia were not arrested by the PBN and neither were they in Helicoide, that is false. 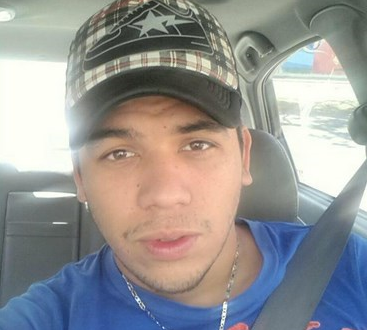 On February 19th the body of Jhon Barreto Ramírez (21) was found in an advance state of decomposition in the state of Táchira. The youth studied at the National Experimental University of Táchira (UNET). Barreto had a bullet wound in the head reported La Patilla. La Patilla also reported that this past February 17 students José Daniel Frías Pinto (20) and Julio Alejandro García Adonis (22) of the University of Los Andes (ULA) were found dead in a thicket in Zulia state. Both were handcuffed with signs of torture and were shot in the head. This troubling pattern of shots to the head of student opposition activists was first observed in February of 2014. Summit live streamed from Geneva. Register here. GENEVA, Feb. 10, 2014 - The Hong Kong pro-democracy protests that have captured the world's attention will be spotlighted at the seat of the U.N. Human Rights Council, when two of its leaders -- Alex Chow and Lester Shum, president and vice-president of the Hong Kong Federation of Students -- will speak out in Geneva for the first time, joining top-name dissidents from Iran, Russia, North Korea, Turkey, Cuba, Venezuela and Ukraine, for the 7th annual Geneva Summit for Human Rights and Democracy, on February 24, 2015. The acclaimed annual conference is timed to take place in Geneva days before foreign ministers gather to open the 2015 U.N. Human Rights Council session, chaired this year by Germany. "It's a focal point for dissidents worldwide," said Hillel Neuer, executive director of the Geneva-based UN Watch, which for the seventh year in a row will be organizing the annual event together with a cross-regional coalition of 20 other human rights groups. "The speakers’ compelling and vivid testimonies will seek to stir the conscience of the U.N. to address critical human rights situations around the world," said Neuer. Subjects on the program include discrimination against women, jailing of journalists, prison camps, Internet freedom, religious intolerance, and the persecution of human rights defenders. Admission to this year’s February 24, 2015 summit is free and open to the public, but registration is mandatory. For accreditation, program and schedule information, visit www.genevasummit.org. The conference will also be available via live webcast. 15:45 Can Communist Regimes Reform? Part 2: The Case of Cuba: Road to Reform? The regimes in Cuba and Venezuela are so focused on preserving power and the repressive status quo that they are willing to kill future leaders that represent a nonviolent alternative to them. 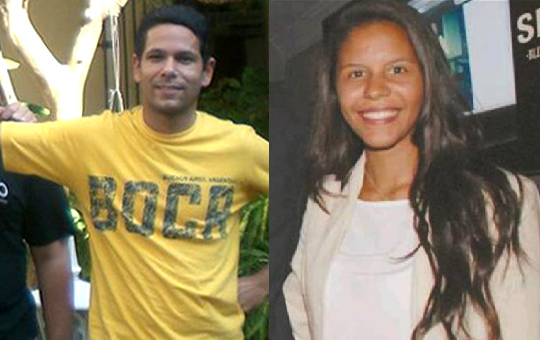 The untimely deaths of Oswaldo Payá Sardiñas and Laura Inés Pollán Toledo in Cuba and the threats to the lives of Leopoldo López Mendoza and Maria Corina Machado in Venezuela are ever present reminders of this harsh reality. Sadly, these regimes are also targeting the next generation of democratic leaders as well. In Venezuela, Geraldine Moreno Orozco, (age 23 year) was shot repeatedly in the face by members of the Bolivarian National Guard (GNB) on February 19, 2014 and died from these injuries three days later on February 22nd one year ago today. Today at 6pm in Geraldine Moreno Park in Venezuela United Friends Tazajal and Victims Against Repression will paying homage to Geraldine Moreno Orozco and Génesis Carmona. Two years and seven months ago today Harold Cepero Escalante (age 32) and Oswaldo Payá Sardiñas were killed in Cuba. This was done so that with impunity the Castro regime would carry out the fraudulent change that both of them had denounced. Oswaldo was a founder and leader of the Christian Liberation Movement and Harold was its youth leader. The Christian Liberation Movement is circulating a petition calling for an international investigation into their untimely deaths. Democracy and human rights are in decline in the Americas. Part of the reason is the coordination of resources and repression techniques between authoritarians and totalitarians throughout the region. If the fortunes of democracy and human rights are to be turned around for the better in this hemisphere then democrats need to join together and coordinate resources and best practices. Learning how to be more effective in denouncing the murder, unjust imprisonment and terrorizing of democrats, human rights defenders and journalists in the hemisphere and coordinating efforts to campaign against these practices is a necessary part of the puzzle for making things better. 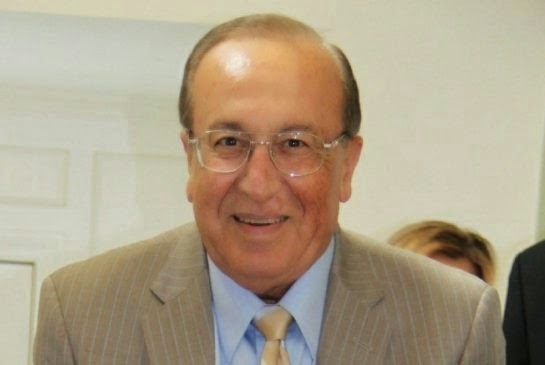 Reuters, AP, and CBC are reporting that Canadian automobile executive Cy Tokmakjian is back home in Canada after spending three years unjustly imprisoned in Cuba and following a show trial on September 28, 2014 in which he was sentenced to 15 years in prison. (He is not the only Western executive to undergo the experience). [the Castro regime] seized about $100 million worth of company assets including bank accounts, inventory and office supplies, a ruling the company was challenging in international arbitration. Tokmakjian family says his prosecution was an excuse to seize his Ontario-based Tokmakjian Group's $100 million in assets in Cuba. Taxpayer dollars underwrite Canada's trade with Cuba. Peter Foster in The Financial Post on September 30, 2014 concluded his OpEd stating, "let’s also stop taxpayer backing for Cuban trade and investment. And let’s hope all those Canadian tourists who flock to Cuba every year give a passing thought to what their dollars are supporting." The Tokmakjian reaped took the risk and reaped the benefits for 20 years and when the Castro regime pulled the plug, its Canadian taxpayers assuming the risk and left holding the bag. This is the formula agri-business and the Chamber of Commerce want for US companies involved in US-Cuba trade but prefer that US taxpayers learn about it after the fact. "Cuba is responsible for violating the right to life (Article I of the American Declaration of the Rights and Duties of Man) to the detriment of Carlos Costa, Pablo Morales, Mario De La Peña, and Armando Alejandre, who died as a result of the direct actions of its agents on the afternoon of 24 February 1996 while flying through international airspace." "Cuba is responsible for violating the right to a fair trial (Article XVIII of the American Declaration of the Rights and Duties of Man) to the detriment of the relatives of Carlos Costa, Pablo Morales, Mario De La Peña, and Armando Alejandre, in that to date the Cuban authorities have not conducted an exhaustive investigation with a view toward prosecuting and punishing the perpetrators and have not indemnified those same relatives for the damage they suffered as a result of those illicit acts." Beginning the week following the Saturday, February 24, 1996 shoot down the Free Cuba Foundation, a student movement founded at Florida International University in 1993 at the time with a second chapter at the University of Miami Holds Candlelight vigils at both universities. On Saturday, March 2, 1996 members of the Free Cuba Foundation participated in a flotilla that sought to journey to the spot both planes were shot down and hold a memorial service. On December 12, 2001 the leader of the Cuban spy ring, Gerardo Hernandez, was sentenced to life in prison for conspiracy to commit murder in the Brothers to the Rescue shoot down. President Barack Obama on December 17, 2014 commuted his life sentence and returned Mr. Hernandez to Cuba. 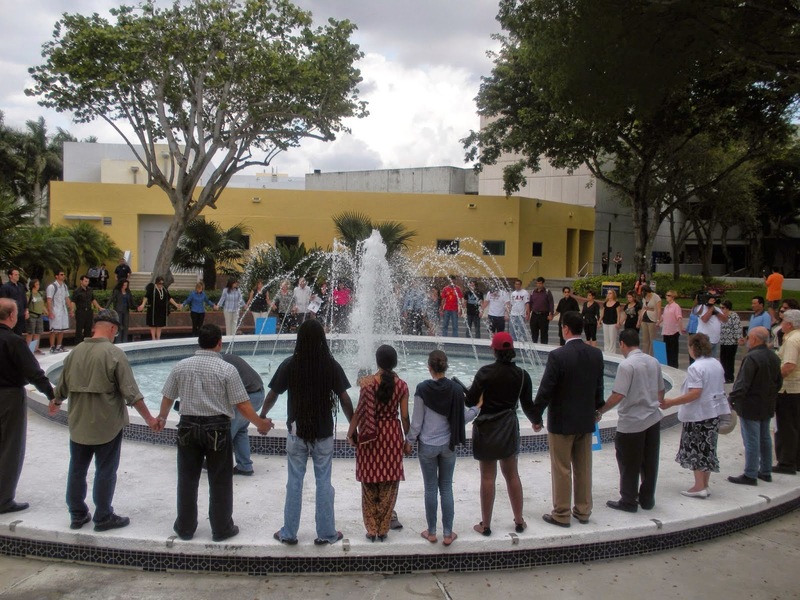 For the past 18 years members of the Free Cuba Foundation have gathered at the main fountain at Florida International University beginning at 3:21pm, the time the first plane was shot down, in a silent vigil until 3:27pm, the time the second plane was shot down. 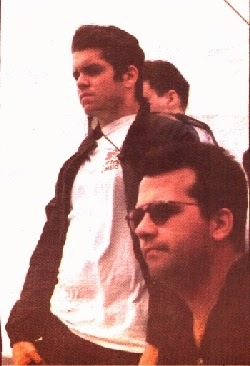 Carlos Costa and Pablo Morales were on the first plane. Mario de la Peña and Armando Alejandre Jr. were on the second plane. Next Tuesday, February 24 at 3:21pm sharp FIU students, members of the FIU community and the families of the four men murdered in 1996 will for the nineteenth time gather at the main fountain at Florida International University in a silent vigil for justice. This silent vigil seeks to remember the facts in the service of truth while demanding justice. Truth, memory and justice are necessary elements for a real and lasting national reconciliation. Join the hundreds of FIU students who since 1996 have done their small part standing up for national reconciliation in Cuba by demanding truth and justice in the Brothers to the Rescue shoot down. 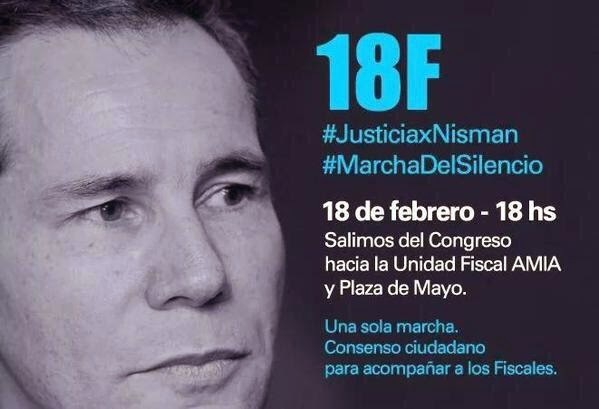 The case of Alberto Nisman, the Argentine prosecutor found dead hours before testifying on the 1994 AMIA bombing on January 18, is shaking up not only the political establishment with an investigation that reaches into the office of the presidency but the entire country. Panam Post provided a breakdown of who's who in the Nisman case. 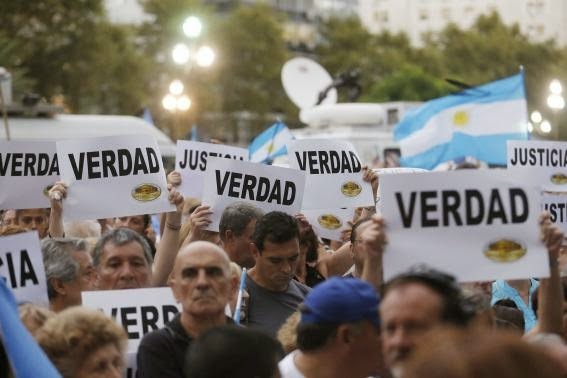 On the one month anniversary of his death a quarter of a million Argentines took to the streets in a silent march carrying signs that read: "Verdad" and "Justicia" (Truth and Justice in Spanish). 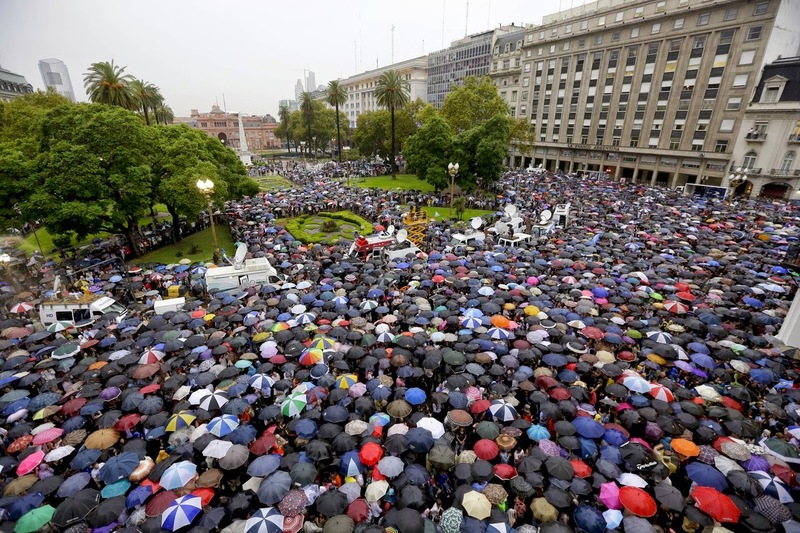 The protest was called by federal prosecutors and attended by the prosecutor's family and opposition politicians. The prosecutors organizing the event called for a silent march to elevate from the hustle and bustle of normal political protests and it succeeded. The motive for killing Nisman was apparently in order to avoid implicating President Kirchner in a criminal conspiracy to cover up the 1994 AMIA bombing, the greatest terrorist act in Argentine history. Below is an advert for the February 18, 2015 protest. 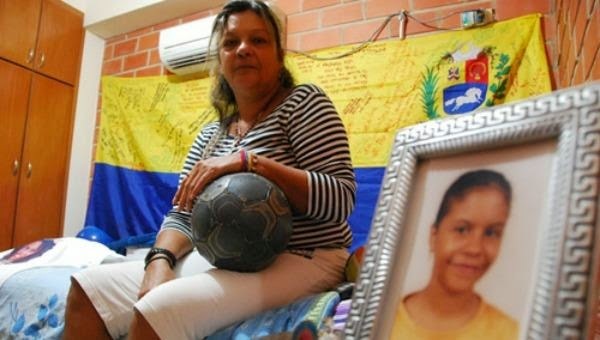 Liseth Madía, cousin of Geraldine Moreno Orozco, recounted to El Universal that the 23 year old university student and athlete from Carabobo was shot repeatedly in the face by members of the Bolivarian National Guard (GNB) on February 19, 2014 during a demonstration in the area of the Naguanagua municipality in the Tazajal sector. "That was around 8:00 pm in front of her house in Bayona Country I residences, she was assaulted in a cowardly manner with a weapon that fires pellets, which were not plastic but of iron." Geraldine Moreno who was in her fifth semester of Cytotechnology at Arturo Michelena University, was with four friends and from her residence they watched the persons protesting on the corner of the street where there was a barricade when six members of the Bolivarian National Guard (GNB) on motorcycles arrived on site to disperse the demonstration. Everyone present ran. "She (running) turned when the persons behind her came and she fell because they shot at her and fired near the face, then when she tried to stand up they fired again into her face and that is when they destroyed all her visage," said Geraldine's cousin Madia . At 12:43pm on February 22, 2014 the student from Valencia, Geraldine Moreno, died. She died from the wounds generated by the pellets fired at close range into her face by members of the National Guard who destroyed her face and one eye. According to the Panam Post four military functionaries have been arrested and are on trial for the killing of the 23 year old studis no longer independentent. On January 8 the hearing for the functionaries implicated in this murder was deferred for the sixth time. Unfortunately, the judiciary in Venezuela is no longer independent and is subject to the whims and designs of the executive which means in practice Nicolas Maduro. Geraldine's mother, Rosa Orozco in a February 5, 2015 interview with NTN24 denounced the judicial delays and recalled the circumstances of her daughter's murder: "Those GNB fired into Geraldine's face, she was peacefully standing in the door way of her home and some GNB arrived shooting." ... "Finally she asked the Ombudsman to dedicate himself to all the victims"and work to resolve the cases of the 43 victims of the violent protests that took place between February and June 2014."